Read Australian folklore and folk tales from authors K. Langloh Parker and Andrew Lang in a rich collection of stories that capture the culture, identity and customs of the land. Jump to full list of Australian tales. About: Australian folk tales can be traced back tens of thousands of years. The folklore of the Aborigine was and remains the foundation of their culture and identity because it is used as a means to retain their laws, faith and knowledge of plants, animals and the land. Writer K. Langloh Parker, earned the trust of the Narran Tribe, and that is how many aboriginal stories were first collected and imparted to the rest of the world with her collection, Australian Legendary Tales, followed by More Australian Legendary Tales, both of which are collected here. Andrew Lang also collected and included the region’s folk tales in his Rainbow Fairy Books. Illustration by an unknown artist from the introduction of More Australian Legendary Tales (1898), David Nutt. Called “The Dreaming,” in aboriginal culture, the stories ensure the sustainability of life, land and the sacred, spiritual practices specific to various regions in Australia. 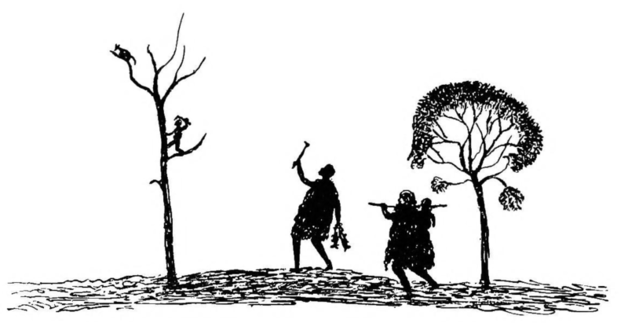 Abounding in creation myths that honor the Earth, and reveal the eternal spirit inherent in all things, the aborigine folk tales are more than just stories for children, they are the structure that informs the spiritual and physical practices within aboriginal society. Australian folk tales are largely indigenous with fantastical and terrifying creatures. Many of the folk tales however, are non-indigenous and reflect the expansion of European settlements across Australia with stories of gold miners and drovers, otherwise known as cattle herders. The folk tales paint a picture of a resilient and independent people, who rise to any challenge and are not afraid to confront and oppose authority. Do you think the best tale is still missing? Paste in a link and let us now.